"The heart of Harris County"
Hamilton is a city in, and the county seat of Harris County, Georgia, United States. 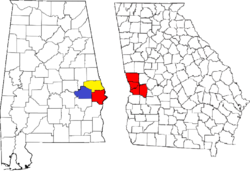 It is part of the Columbus, Georgia-Alabama Metropolitan Statistical Area. The population was 1,016 at the 2010 census, up from 307 at the 2000 census. As of 2015, the population had risen to an estimated 1,158. Hamilton was founded in 1827 as seat of the newly formed Harris County. It was incorporated as a town in 1828 and as a city in 1903. The city was named for U.S. Secretary of the Navy and governor of South Carolina Paul Hamilton (1762-1816). In January 1912, the lynching of a black woman and three black men in Hamilton attracted national attention from the press and widespread outrage. Dusky Crutchfield, Eugene Harrington, Burrell Hardaway, and Johnie Moore had been held for questioning in the death of a white landowner. They were later shown to have been utterly innocent. They had never even been arrested. A mob of white men took them outside town, hanged and shot them. While many white families tried to build walls of silence around the murders, the effects of these crimes were long-lasting. Coverage by local white newspapers at the time suggested the four were guilty. The Montgomery Advertiser did not even report their names correctly. Hamilton is located slightly northeast of the center of Harris County at 32°45′53″N 84°52′23″W﻿ / ﻿32.76472°N 84.87306°W﻿ / 32.76472; -84.87306 (32.764669, -84.873103). U.S. Route 27 runs through the city from north to south, leading southwest 25 miles (40 km) to Columbus and north 8 miles (13 km) to Pine Mountain. Georgia State Route 116 intersects U.S. Route 27 in the city for a very short concurrency. Atlanta is 87 miles (140 km) by road to the northeast. The city is located at the southern base of the Pine Mountain Range, the southernmost mountain range of the Appalachian Mountains. According to the United States Census Bureau, the city has a total area of 3.3 square miles (8.6 km2), all land. As of the census of 2010, there were 1,016 people, 339 households, and 179 families residing in the city. The population density was 351.0 people per square mile (909.1/km²). There were 339 housing units at an average density of 69.0 per square mile (26.6/km²). The racial makeup of the city was 65.35% White, 32.68% African American, 1.63% Asian, 0.33% from other races, and 0.33% from two or more races. Hispanic or Latino of any race were 0.33% of the population. There were 131 households out of which 35.1% had children under the age of 18 living with them, 42.0% were married couples living together, 19.1% had a female householder with no husband present, and 36.6% were non-families. 34.4% of all households were made up of individuals and 20.6% had someone living alone who was 65 years of age or older. The average household size was 2.34 and the average family size was 3.00. In the city, the population was spread out with 27.4% under the age of 18, 5.5% from 18 to 24, 25.7% from 25 to 44, 22.5% from 45 to 64, and 18.9% who were 65 years of age or older. The median age was 39 years. For every 100 females, there were 89.5 males. For every 100 females age 18 and over, there were 78.4 males. The median income for a household in the city was $32,143, and the median income for a family was $38,750. Males had a median income of $28,750 versus $32,083 for females. The per capita income for the city was $18,292. About 5.2% of families and 12.4% of the population were below the poverty line, including 9.6% of those under the age of eighteen and 21.8% of those 65 or over. The Harris County Courthouse is located in Hamilton. The building was designed by Georgia-born architect Edward Columbus Hosford. A statue honoring Hamilton's Confederate dead stands in the town square. Harris County High School is located in Hamilton. A historic marker in the town square commemorates the life and legacy of renowned shape note-singer and songwriter B.F. White. Hamilton Baptist Church and Pastorium was added to the National Register of Historic Places on August 19, 1982. Mountain Hill District Consolidated School was added to the National Register of Historic Places on December 31, 1998. Midway Baptist Church was added to the National Register of Historic Places on September 9, 1999 as part of the Sunnyside School-Midway Baptist Church and Midway Cemetery Historic District. ^ "Hamilton, Georgia". City of Hamilton. Retrieved May 17, 2017. ^ a b "Geographic Identifiers: 2010 Demographic Profile Data (G001): Hamilton city, Georgia". American Factfinder. U.S. Census Bureau. Retrieved May 17, 2017. ^ Hellmann, Paul T. (May 13, 2013). Historical Gazetteer of the United States. Routledge. p. 232. ISBN 1135948593. Retrieved 30 November 2013. ‡ This symbol represents that the indicated city is part of two or more counties. This page was last edited on 5 December 2018, at 18:29 (UTC).